You've found the “U.S. Dominique Chicken Breeders” page here at Hobby Farm Wisdom! If this is the first time you have visited our site: Welcome! Dominique is the oldest American breed of chicken, originating during the Colonial period from chickens imported from Southern England. Also known as Dominicker or Pilgrim Fowl, these birds are used for both meat and egg production. They are good layers, averaging approximately 230 small to medium sized eggs per year. Historically, their feathers were in demand for pillow and mattress stuffing. 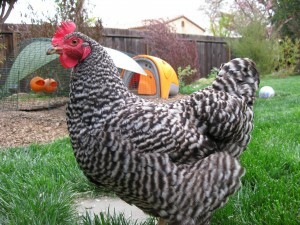 The Dominique chicken has a distinctive appearance with a rose comb and irregularly patterned feathers known as barring. These feathers are often mistaken for black and white but are actually dark and light grey. While they are a friendly, docile breed, their popularity has decreased over the last few decades as other breeds have become more popular.